Do your children want an in-ground trampoline? Have you been resisting because you’ve heard soem “bad things” about them. People love to bounce! If you’ve ever bounced on a trampoline you know that’s true! Bouncing aka rebounding on an in-ground trampoline is fun and healthy. So get bouncing! An in-ground trampoline won’t ruin any sight lines from your house or in your backyard. You won’t spoil any landscaping nor will you need to remove trees or add soil to accommodate it. Used correctly, they aren’t dangerous. One person at a time. Be careful where it’s placed so there are no overhanging branches or anything that could injure someone if they bounce too high. Buy an in-ground trampoline from a reputable dealer and use all of the safety equipment provided. You can get in shape on a trampoline and not risk injury. You can strength train your legs. Amp up your cardio. Strengthen your core. You’re never too old for an in-ground trampoline. Regardless of your age you can enjoy time on an in-ground trampoline. Jumping on one will help with balance and that can be ideal as you age. 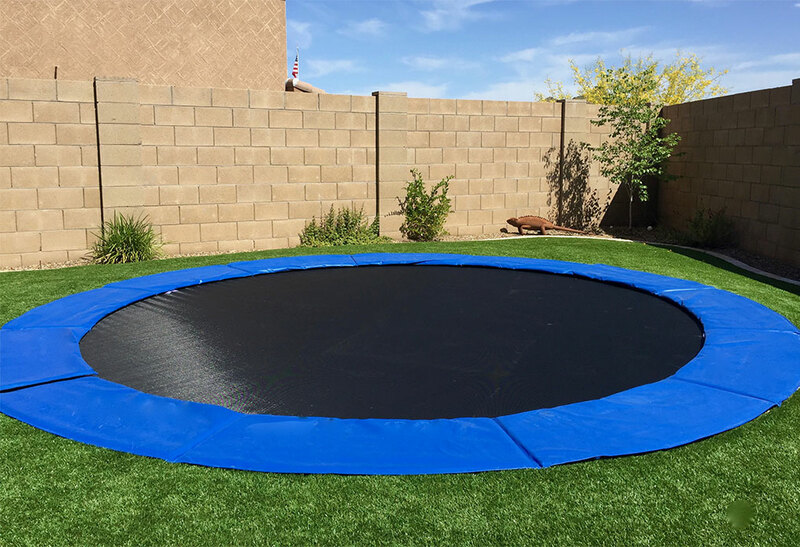 What questions do you have about getting an in-ground trampoline? Give us a call and let’s get them answered!